Founded in 2005, Brilliant Earth Rings is still a rookie in the world of wedding rings, but boy did they hit the ground running. Brilliant Earth Rings designers Beth Gerstein and Eric Grossberg founded Brilliant Earth rings as students in Stanford University when Beth had trouble finding a ring that suited her aesthetic and moral requirements – from there, history rewrote itself! The rings at Brilliant Earth are made from recycled metals and stones obtained by economically, environmentally, and socially conscious means that adhere to environmental and labor laws. 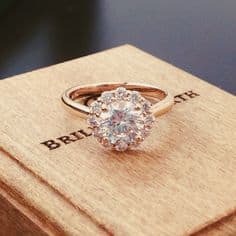 Brilliant Earth donates 5% of their profits to areas impacted by the brutality of the jewelry industry, and thus, make themselves a valid candidate for the eco-friendly couple. Brilliant Earth is the perfect choice for those in search of a variety of recycled precious metals, conflict free stones and diamonds, and the option to design their own rings. If you’re looking for a rich history, these are the rings for you. Cartier wedding and engagement rings have been around since 1847 – that’s over a 150 years of experience! Cartier is also a leader in innovative settings and designs. The most popular Cartier design was created in 1924 – the Cartier Trinity ring. It consists of three interwoven 18k bands: one white, one gold, and one rose gold. The Trinity ring is representative of the trinity of a balanced relationship, where white represents friendship, gold represents royalty and fidelity, and rose gold represents love. Cartier has held a highly renowned ranking in world of jewelry and watches and its reputation in wedding and engagement rings is no different. Cartier is the route to take if you want a ring from a designer that has a long rooted history in quality jewelry and defines luxury and elegance. CRED, like Brilliant Earth, is another designer that focuses on environmentally and socially friendly techniques in mineral and stone extraction. Founded in 1996, CRED’s mission centers heavily on fair-trade trade practices and is currently working in unison with 9 mines in Africa in an attempt to introduce fair-trade gold into the country for the first time. CRED has founded the CRED foundation, a non-profit charity that assists projects develop struggling communities worldwide. While CRED designs a wide array of wedding and engagement rings, the also utilize resources from Oro Verde. Oro Verde is the world’s first certified green-gold. Through utilizing Oro Verde, CRED stands by their promise to provide their clientele with only the purest, eco-friendly, and socially empowering wedding jewelry in the market. CRED is the easy choice for those who are in the market economically, environmentally and socially friendly rings while wanting to promote a company that advocates for fair labor laws and social equality around the world. If titanium is the route you want to take in your wedding ring bliss, look no further than Edward Mirell. Edward Mirell does a stunning job combining the beauty and traditionalism of wedding jewelry with contemporary designs. While most rings in this line are darker than the traditional gold or platinum normally found in wedding band designs, Edward Mirell has not secluded the adventurous bride. In fact, the radiance line provides the durability and sustainability of titanium jewelry without sacrificing an array of bright and vivid colors. If ethics are your concern, Edward Mirell uses only conflict-free diamonds; in terms of metals, mining titanium has minimal social and environmental concerns when compared against its gold and platinum counterparts. Titanium, in and of itself, hold many wonderful characteristics: it is biomechanical, corrosion resistant, and hypoallergenic. Combinining the inherent strengths of titanium with the incomparable designs of Edward Mirell results in a winning team – one that should be at the top of your list when shopping for your wedding ring! These days, it isn’t odd to see brides and grooms alike to stem towards gemstone as their wedding ring stone, and who can blame them? Gem stones provide a stunning unique look while, generally, being a little more affordable than the widely popular diamond. Gamvara is a designer who is in a class of its own in terms of constructing intricate designs using gemstones. Gemvara is different than the aforementioned listings in that it allows its customers to provide its own stones to be reset into new bands – this is a unique, but advantageous, business model that makes an exceptional impact on price savvy couples, or those wanting to incorporate family heirlooms into their big day. Through utilizing their knack for beautiful designs and ability to read the market, the folks over at Gamvara are changing the jewelry game by providing one of a kind designs while extending the option to mix the beauty of age-old stones with the strength and integrity of modern metals. Kerstin Laibach’s designs are as stunning as they are organic, they’re economically friendly while retaining artistry, and most important, they are truly one of a kind. Kristen Laibach is committed to more than economically, environmentayl and socially friendly metals and diamonds – she takes her appreciated for the art, the people, and the art further in every which way she could. Kerstin Laibach’s designs are 100% handcrafted, that is, they aren’t pumped out in hundred by a machine, rather, each etch and engraving is the product of a human spending one on one time, devoting their artistry, to your ring only – this feature makes Kerstin Laibach’s rings genuinely one of a kind. What makes Kerstin Laibach truly unique is her devotion to animals through omitting animal by-products in her vegan-friendly designs. While economically and socially friendly designers are becoming a commodity these day, and thankfully so, Kerstin Laibach elevates the standard by being earth friendly. While Krikawa strives to provide an environmentally, economically and socially friendly service, their mission statement expresses their desire to not lose focus of the customers independent needs in the process of wedding ring shopping – and as far as we can tell, they stand by that. Krikawa’s wedding rings range from diamond studded luxury to feminine lace-inspired lace work, providing a service that strives to appeal to all walks of life. If you’ve been in the market for a wedding ring for what feels like decades, but are unable to find the ring that speaks to you, Krikawa may have your solution. 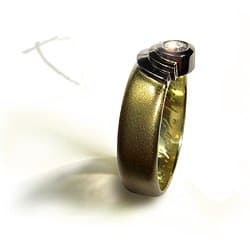 While Krikawa has a wide-selection of pre-designed rings to choose from, in a large variety of metals and stones, they also offer an easy to use online customer ring design feature for couples that want to design their rings themselves. If you’re getting married, this designer has probably been brought up more than once. Even if you’re not getting married, you’ve certainly crossed path with one of Tiffany & Co.’s many staple items – their lockets, bracelets, tennis bracelets, or their very own shade of blue (Tiffany Blue). Tiffany & Co.’s designs use a variety of metals and stones and the designers are extremely helpful in finding a combination that works best for each client. Though elegant and luxurious, Tiffany & Co’s, designs are simple and sleek, allowing the high quality of their products speak for itself. Tiffany & Co’s rings also have a history of appreciating in value over years of ownership – that is, your ring will be valued at a higher price after ten years than it was when you purchased it. While most of their rings aren’t budget friendly to the frugal consumer, Tiffany & Co. is the way to go for the couple looking to make an investment when buying their delicate, wearable, and rich in history wedding ring. The sky is the limit when you’re searching for designer wedding rings – but the above-referenced designers are heavy-hitters in the jewelry game and a good place to start (and possibly end) your search. Did you buy from one of our suggestions? Did you buy elsewhere? Drop us a comment below and let us know (and see!) what you bought it, where you bought in, and what made you make the decision to purchase it from where you did. Your favorite designer might even make the list!